Although it is in no way mystical, as with “Field of Dreams” (1989), “Moneyball” is about much more than baseball. It is about taking risks; it is about regrets; it is about making tough decisions; and, as a baseball movie should be, it is about the underdog. Although a drama based on Michael Lewis’ book of the same title, the brilliantly adapted screenplay (written by Aaron Sorkin and Steven Zaillian) provides plenty of lighthearted and humorous material. I didn’t expect to laugh as much as I did throughout this movie. Filled with quick-witted dialogue, the film features powerful performances from Oscar nominee Brad Pitt and funny-guy Jonah Hill. Director Bennett Miller (“Capote” 2005) has hit this one out of the park, making “Moneyball” a sports film for the history books. The on-screen chemistry between Pitt (“Tree of Life” 2011) and Hill (“Get Him To The Greek” 2010) are reminiscent of Tom Cruise and Dustin Hoffman in “Rainman” (1988). Like Laurel and Hardy, Felix and Oscar, and Butch and Sundance, they play to each other extremely well, with Pitt taking the lead and Hill following with precision. If you are not a fan of baseball, you may think that the storyline will drag for you. Think again. I pay absolutely no attention to professional baseball, not even the World Series, and I am happy to report that I was engaged from beginning to end, whether the dialogue concerned baseball or not. 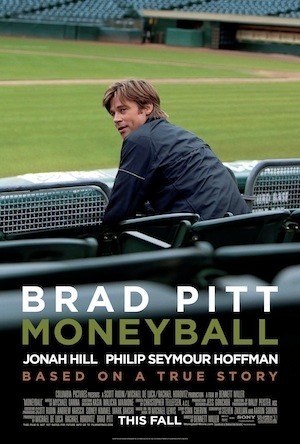 Starring Pitt as Billy Beane, “Moneyball” is based on the true story of the General Manager of the Oakland A’s, who decided to try something out of the ordinary when putting together the 2002 team. Much of the history is presented to the viewer by way of archive footage and commentary, which works very well in keeping the reality of the story at the forefront. Academy Award® winner Philip Seymour Hoffman, who worked with Miller in his Oscar winning role as Truman Capote, has a supporting role as Oakland’s manager, Art Howe. Rounding out the cast is Chris Pratt as Scott Hatteberg, Stephen Bishop as David Justice, Robin Wright as Beane’s ex-wife, Sharon, and, as the A’s scouting team, several professional baseball scouts cast alongside veteran actors. The scouting team is golden; they are so in sync, it feels as if they are one character. The Oakland A’s had very little money, and Beane was tired of fighting a losing battle, constantly watching his star players be lured away by rich teams. As one radio broadcaster said while discussing the A’s, “It’s like we’re a farm system for the NY Yankees.” While visiting the offices of the Cleveland Indians, Beane meets Peter Brand (Hill), who believes in “Sabermetrics,” a term coined by baseball historian Bill James. This idea uses statistical analysis to predict the future value of a player. Peter is a fictional character created for the screenplay. Score one for the screenwriters, as this character was, I believe, essential in helping this story play so well as a film. Peter is a recent Yale Economics graduate, a numbers cruncher who happens to love baseball. Hill was so likable and perfect in this role; it makes me wish Peter Brand really existed. In the movie, Beane recognizes the potential of Peter’s talent and pounces on it. As much as the story follows the unconventional reinvention of the team, the movie has a less prominent, but not less important, narrative of Beane’s relationship with his daughter, Casey (Kerris Dorsey). Dorsey’s small role in the movie is perhaps what gives “Moneyball” its most powerful punch. The scenes between Pitt and Dorsey are touching and memorable, especially when Casey sings to her dad. Although “The Show” (a 2008 song by Lenka) was not released until six years after the movie takes place, it is one of the smartest song choices for a film that I can remember. Wise choices were also made in scenes where Beane does his best not to listen to or watch the A’s baseball games. It’s a prime example of how to convey the story without dialogue, and Pitt plays it like the pro he’s become. Without question, Pitt carries the bulk of the movie, and he makes it look easy. *The PG-13 rating is for some strong language. This movie is suitable for family viewing.